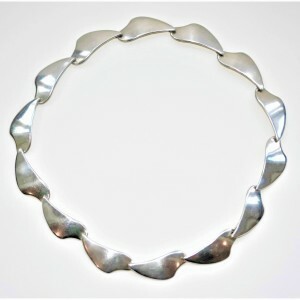 Lovely vintage sterling silver button necklace by Niels Erik FROM Denmark c1950. Each link consists of a central silver ball in oxidised silver surround, adding drama to the design. In excellent vintage condition, the simple toggle fastening means that the necklace could be extended if so wished. Measurements: length of necklace is 36cm x just under 0.75cm width.